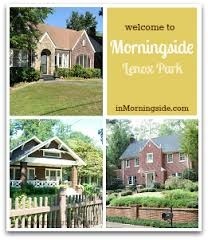 With about 8,000 people, Morningside, located in the city of Atlanta and Fulton County, offers lots of character; it is often called Morningside/Lenox Park because of the two neighborhoods' proximity to one another. The neighborhood was founded in 1931, and the majority of homes were built between 1918 and 1935. The community features beautiful, tree-lined streets with restored Craftsman, Four-Square and Tudor-style homes. The area has its share of history, with many streets named after early settlers, including such last names as Luckie, Plaster and Cheshire. Morningside offers a popular nearby commercial district, with shops and restaurants, as well as the locally famous Alon's Bakery, a European-style bakery that has been open since 1992. The neighborhood is also a relatively easy commute to Georgia State University and downtown. Residents in the area enjoy the Morningside Farmer's Market, open Saturday mornings year-round. The farmer's market, which has been operating since 1995, offers fresh, certified organic seasonal produce meats, breads and flowers, as well as artisan crafts. The market also hosts special events, such as "Shop with a Chef" demonstrations and book signings. Neighbors get a chance to see each other while stocking up on healthy foods. Residents and visitors in this neighborhood also enjoy the Morningside Nature Preserve, between Wellborne Drive and Wildwood Road, which has more than 30 acres of natural green space. The land's features include a one-mile, tree-lined walking trail, and a suspension bridge over South Fork Peachtree Creek. You'll also find trails in the Daniel Johnson Nature Preserve, a 25-acre wooded area located on the south end of Herbert Taylor Park near Beach Valley Road. And if you want to walk through the Morningside neighborhood itself, the hilly streets will give you a great workout. Many residents also participate in the Morningside Community Garden, located on Hillpine Drive at the Georgia Power transmission lines.